When I have been working the whole week I like to take it easy on a Sunday night and I’m always looking to cook something tasty, nutritious and quick. Enter the mushroom – just love this fabulous veggie. It’s always in my fridge and if I’m not flinging them raw into a salad, I’m adding them to stew and sauces. I honestly can’t live without them. Here are a few of the easy dishes I make using them. Cut the brinjals lengthwise into ½ cm thick slices. Lightly brush both sides of the brinjal with some olive oil. Heat a griddle pan or braai. Cook the brinjal slices, in batches, for 2-3 minutes per side. Transfer to a plate and set aside to cool. Heat the oil in a pan and gently fry the onion and garlic for 4 – 5 minutes. Fry the lamb and mushrooms for 3 – 4 minutes. Stir in the harissa paste, cumin, cinnamon and tomato sauce. Simmer for 5 minutes. Stir in the lentils and set aside to cool. Preheat the oven to 160°C. Combine the ricotta cheese, yoghurt and half of the Parmesan cheese in a small bowl. Place a brinjal slice on a work surface and top with a little of the ricotta mixture and a spoonful of the mushroom and lamb mixture. Roll up to enclose filling. 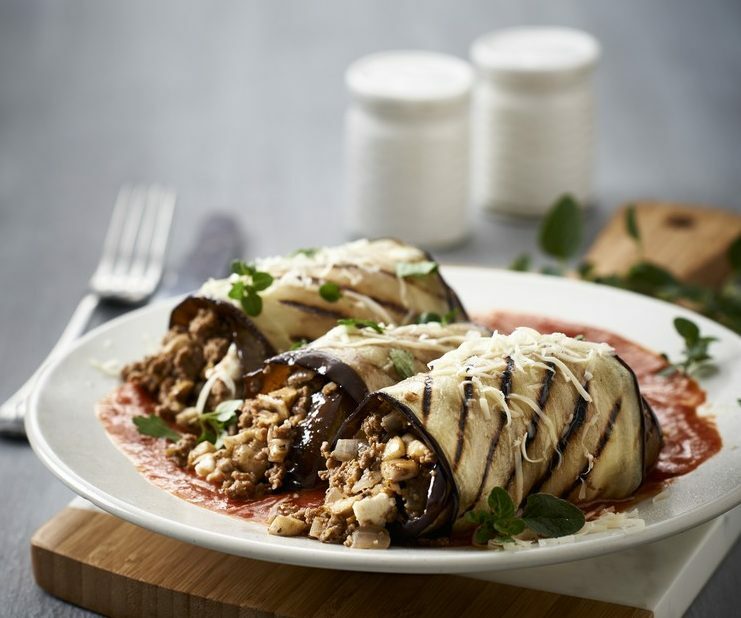 Spread the remaining tomato sauce on the base of an ovenproof dish and place the brinjal roll on top. Repeat with remaining brinjal slices and place in a single layer in the baking dish. Sprinkle the remaining Parmesan cheese over the brinjals. Bake for 15 – 20 minutes. Top with fresh herbs, if desired, before serving. Heat the oil in a pan and fry the mushrooms and paprika for 4-5 minutes, or until the mushrooms are cooked. Set aside. In the hot pan, fry the halloumi slices for 30-40 seconds per side and set aside. Combine the cream cheese, herbs and lemon juice and zest in a small bowl. To assemble, place a toasted wrap on a flat surface a spread some of the cream cheese mixture down the middle. Top with the reserved mushrooms and halloumi cheese, and some avocado slices, rocket and micro salad leaves. Serve at once. Cook’s note: This would also make a good topping for lightly toasted Low GI slices of bread for a healthy and hearty breakfast or lunch.